Already for the fourth time, lavera Naturkosmetik has successfully completed the GREEN BRAND Germany validation procedure and for the first time the new sustainability audit for Green Brand Switzerland. BIOFACH is celebrating its 30-year jubilee, and lavera Naturkosmetik its distinction as a Green Brand. At VIVANESS, Norbert Lux, initiator and Managing Director of the GREEN BRANDS organisation and Peter Jossi, Director of GREEN BRANDS Switzerland, presented the award certificates to company and brand founder, Thomas Haase, and Dr. Henrike Neuhoff (Chief Scientific Officer), Susanne Jansen (Chief Marketing Officer), Tanja-Simone Pigorsch (Chief International Sales Europe). The GREEN BRANDS seal of approval determines the authenticity of a brand in terms of its sustainability claims or promises. Norbert Lux: "GREEN BRANDS evaluates brands from a unique perspective and has awarded the Green Brands seal of approval in Germany since 2012. The validation process is carried out in cooperation with the SERI international sustainable research institute (Vienna), along with high-level and eminently qualified members of the jury at two-year intervals – now already in six countries. In addition to product performance, GREEN BRANDS rates the eco-design, raw material sourcing, along with transport routes, production, packaging, distribution, utilisation phase, processing and waste disposal, as well as the product-related certifications such as Vegan, NATRUE, yet also ISO standards on sustainable management systems. In what was now the 4th revalidation process, lavera Naturkosmetik once again finished with a particularly outstanding result and has been able to boost its rating by 12% over the past 7 years." Peter Jossi: "Sustainability is a fundamental issue, also for Switzerland. That is why we are currently involved in establishing GREEN BRANDS Switzerland. The validation process in Switzerland is based on the same parameters as in Germany, but it is judged by its own independent jury of experts. We are pleased that lavera Naturkosmetik is one of the first brands to be recognised by GREEN BRANDS Switzerland." We set the highest quality standards for our natural beauty care. The lavera Naturkosmetik brand is produced according to the definition for certified natural cosmetics and is 100% NATRUE certified, and some 95% of the products are vegan. Not as obvious to consumer as the labels on the product are our management systems and the sustainable standards associated with them. As a manufacturer of certified natural cosmetics, the company since its foundation has pursued sustainable objectives, which are part of its corporate culture and corporate strategy. In 2017, we introduced an integrated management system that combines the ISO standards for energy management (50001), environmental management (14001), occupational health and safety (BS OHSAS 18001) and process-oriented quality management (ISO 9001-2015). This also integrates additional sustainable standards such as the ZNU standard for sustainable business practices, along with the RSPO standard. That is why we are very pleased about the renewed GREEN BRANDS award and the GREEN BRAND seal of approval with 3 stars which allows consumers to recognise: lavera Naturkosmetik is certified natural cosmetics and a GREEN BRAND – a sustainable, authentic brand." Thomas Haase: "One of our objectives is to continuously save energy and resources in production. the most modern in Europe. Production, transport and distribution will be even more efficient in the future." Since its founding, the company has believed that nature is the only true source of beauty care. From the beginning, the aim was to produce beauty care products from only natural, and wherever possible, organic ingredients, to provide long-lasting beauty care to the skin, to manufacture its own products and to combine nature, science and state-of-the-art technology. As a family-run medium-sized company and natural cosmetics manufacturer, Laverana has a unique selling point: From the product idea, right down to delivery, each work step is carried out in a controlled value chain and a closed-loop competence chain. 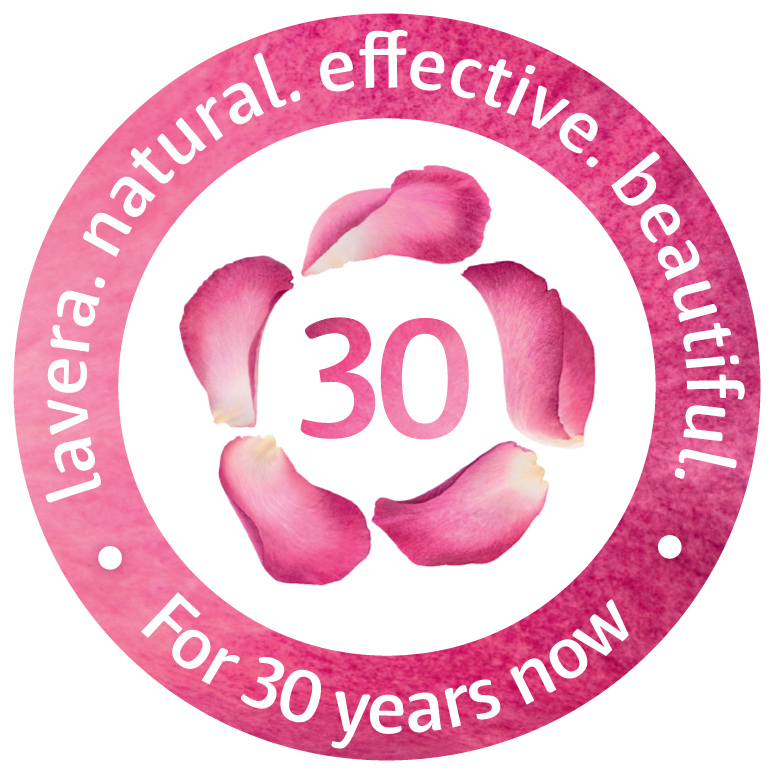 With the lavera Naturkosmetik brand, for over 30 years now, we have been offering our customers 100% natural, age-independent beauty care. The range encompasses some 250 products, available in 40 countries. Made in Germany, made in the Hanover region – 100 % certified natural cosmetics according to NATRUE – lavera. Natural. Effective. Beautiful. GREEN BRANDS is an international, independent and autonomous brand evaluation organisation, which recognises environmentally sustainable brands and awards the GREEN BRANDS seal of approval. The worldwide unique three-phase validation process is carried out in cooperation with the SERI international sustainable research institute (Vienna) and high-level and eminently qualified members of the jury at two- year intervals. In addition to Germany and Austria, GREEN BRANDS is also active in Switzerland, Hungary, Slovakia and the Czech Republic, and has already recognised 170 brands after more than 450 validations.